Scorpius. © 2003 Torsten Bronger. 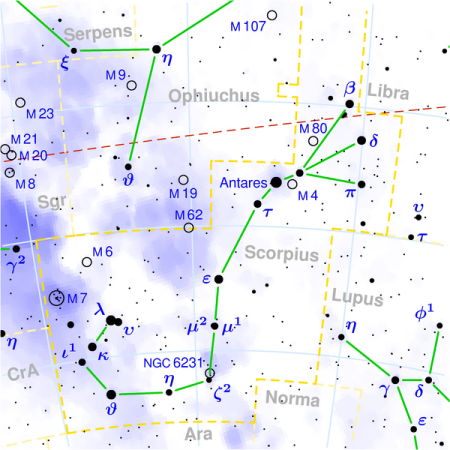 Scorpius (abbreviation: Sco), the Scorpion, isa prominent constellation of the southern hemisphere and the eighth of the zodiac. Scorpius is one of the few constellations to actually look like what it represents. It lies south of Ophiuchus and west of the northern part of Centaurus. It also lies on the ecliptic between Libra and Sagittarius. The Milky Way passes through this region, and it contains several open clusters and globular clusters. Its brightest star is the first magnitude Antares (Alpha Scorpii). See below for details of the constellation's other brightest stars and interesting deep sky objects.